Coast shoreline by rushing, ancient rivers. The rivers are long gone, but the sand is still there and every April, the sand gets shaped into “sandtastic” sculptures at the Pier 60 Sugar Sand Festival held this year April 13-22. The theme is “SEA America, a Celebration of America’s Treasures.” Artists will use about 1,000 tons of sand that they will mix with water and pack into big wooden forms to create surface tension. They create their sculptures with trowels and other tools, including toothpicks for those very fine details. 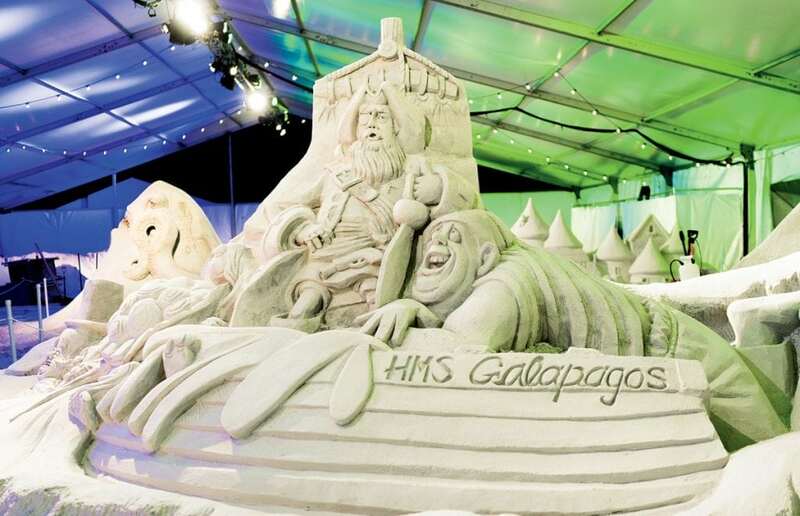 The centerpiece of the show is the Sugar Sand Walk Exhibit under a cool 21,000-square-foot beach tent. Admission is $10 for adults, $8 for adults over 55, military personnel, police officers, firefighters, and teachers (I.D. required), and $6 for students up to age 17. Artists go to work on April 14th. The festival features free activities, too, such as a children’s play area, street musicians and performers, craft displays, fireworks, and sculpture demonstrations. Boaters can tie up at Clearwater Beach Marina and walk to the festival on the beach. And, in the typically calm waters here, many boaters just drop anchor outside the swim zone then paddle or putt-putt to shore.